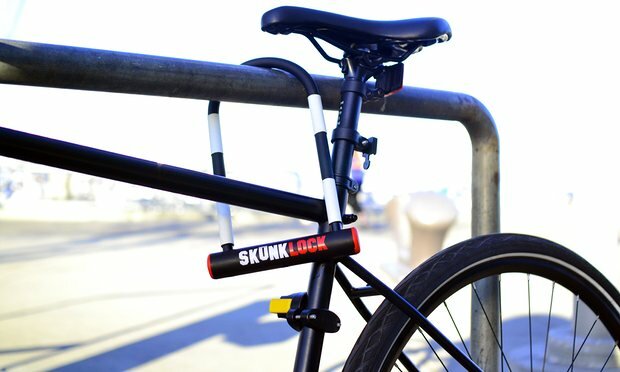 The aptly-named SkunkLock is an ingenious bicycle lock that blasts would-be thieves with a disgusting cocktails of chemicals that most of the time causes them to vomit uncontrollably. When San Francisco-based Daniel Idzkowski learned that over 1.5 million bikes are being stolen across the United States, every year, he decided it was up to him to come up with a more efficient means of theft prevention. After six months of work, he came up with the SkunkLock, a hollow steel U-lock system which houses presurized noxious chemical deterrent that’s even detectable through some of the most advanced gas masks. The proprietary formula, known as D_1, was developed by Idzkowski and his partner Yves Perrenoud, and is perfectly legal. The SkunkLock is made out of hardened medium-carbon steel that exceeds 450 brinell, and is painted in black and white stripes reminiscent of a skunk. They hope that the pattern and SkunLock logo will scare away thieves, but if they insist on cutting through it, they will be in for a nasty surprise. The smell is apparently so bad that it will stun perpetrators and cause them to either run in disgust or vomit almost instantly. And if they somehow find away to avoid the smell, it will certainly catch the attention of passers-by and increase the chances of preventing the theft. In case you’re afraid the SkunkLock might malfunction and accidentally release the gas in your face, its creators assure us that the only way to puncture the hollow chamber inside is by attempting to cut through it. And just so you never have to do that yourself, they are issuing a standard unique code for each unit sold that can be used to request additional keys in case you misplace the original. The company even offers an overnight key shipping option. 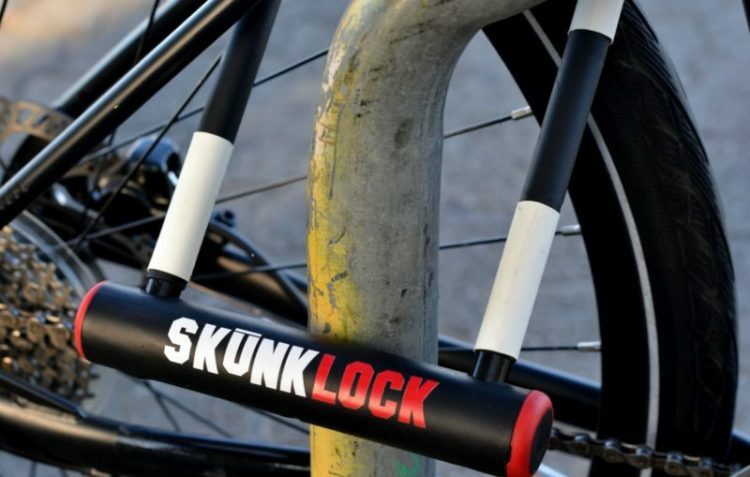 Bike thieves will be relieved to hear that they won’t need to worry about the SkunkLock about another year. Idzkowski and Perrenoud are currently seeking to crowdfund their product through Indiegogo. Their goal is $20,000, of which they’ve only managed to raise $5,598, with a month left to go. If the campaign is successful, they estimate SkunkLock will be available in June 2017. Indiegogo backers will receive one SkunkLock for a pledge of $99.